Divorce is rarely easy and rarely cheap. But there are things you can do to make the process less difficult and less expensive. 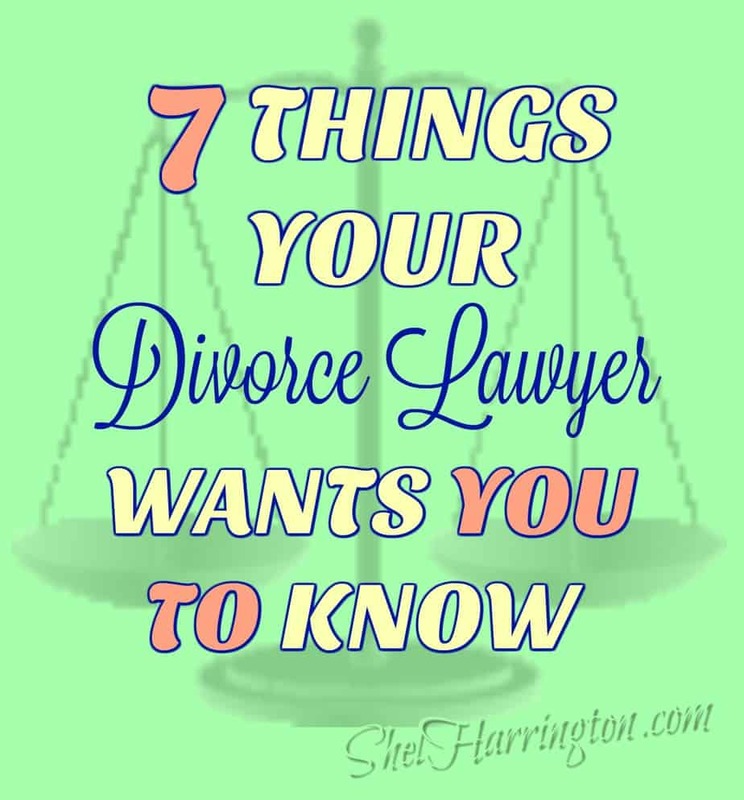 After two decades of practicing Family Law and hearing other Family Law attorneys express concern (read: complain) about the same things, I’ve compiled a short list of things your divorce lawyer wants you to know so you can help them better serve you. Give me the straight scoop on your parenting. Don’t exaggerate the amount of time you spend with the children or the frequency that you bathe, feed, tutor, or otherwise care for them. I get that when both parents live in the same house, the division of labor often results in one parent being more hands-on with the children than the other. If the other parent was the primary care-giver, I need to hear it from you, not opposing counsel in front of the judge. Whether you weren’t as attentive as maybe you could/should have been or you weren’t available because of employment/school/health issues/etc., the result is the same. If you want to have a strong parenting role after the divorce, we have to address the changes that need to be made and available resources for making those changes. On the other hand, don’t minimize the other parent’s parenting role. Unless there are safety issues, the children are going to be spending significant amounts of time with the other parent. The more accurate the information you provide me, the better able I will be to help you craft a proposed custody arrangement that takes into account the strengths of the other parent and the real weaknesses that need to be addressed. Being organized saves you money. If I ask you to bring me a summary and documentation of your bills, debts, and expenses, please don’t drop off a shoebox stuffed with documents. Especially dog-chewed, coffee-dribbled, food-splattered documents. (Think about how you would feel if I sent you a document smeared with a bit of my breakfast jelly or that had a bit of squashed bug on it from when I used it as a fly-swatter. Disgusting, right?) Don’t pay me to sort through your stuff – or for the gloves I might have to purchase to do so! Organize all in chronological order, substitute copies of what is too gross to touch, and attach a typed summary so I know what I’m looking at. The same goes for text messages, emails, and notes that you have made for the case. Don’t take it personally if I interrupt you. I’m not saying it’s okay for me to be rude and I’m not saying I don’t care about your history. But I am very aware of the fact that every minute we speak costs you money. While I do need to have all relevant information regarding your circumstances, if our conversation is going off on a tangent, is repetitive, or otherwise not serving you well, I’m going to move things along. Don’t let me get you more than you want. If you don’t think you can do a 50/50 parenting schedule because of your own conflicts or how you think it would affect the children, make that clear to me. Just because I can obtain a more expansive visitation arrangement doesn’t mean that is what is best for you or your children – help me understand the dynamic. And the same goes for property – don’t get caught up in arguing for half the stuff, then “winning” a property dispute to get something you don’t care about or have to pay to store. That’s not really a win. Help me help you save money by only pursuing what is really important to you. Know that I’ve heard it all before. Don’t “spare me” the uncomfortable points. While I’m not asking you for intimate details, it is relevant if you engage in an alternative lifestyle, have addictions, phobias, or any other situation that you are embarrassed about. I can’t properly advise you and help you navigate through situations I am unaware of. And to make matters worse, if such topics come up for the first time from your spouse’s attorney or, worse yet, in front of the judge, you suffer the humiliation you were seeking to avoid as well as damaged credibility. Tell me if you don’t understand. And don’t apologize for what you do not know or this being your “first time through this.” Hopefully, it will be your only time through this – I’m not interested in helping you get good at it. I’m interested in helping you get through it with the least amount of difficulty possible given the circumstances. Remember: I know nothing about how to navigate in your world. Whether you teach school, make shoelaces, or clean teeth, I would have a hundred questions to ask you if I were trying to understand and help you do your job. If I have explained it and you don’t understand something, ask for clarification. As many times as you need to. Just like I need to understand your circumstances and your goals in the matter, you need to understand the procedure and what I’m doing. We are a team – it takes both of us to get this done and we have to be on the same page. You have to tell me the truth. If I’m going to be able to do my job and obtain the best legal results possible given the facts, I have to actually have the facts. All of them. Don’t lie to me. Ever. About anything. Don’t sugar coat, share information selectively, minimize the negatives or exaggerate the positives. Just give it to me straight. And I promise I’ll do the same in return. Are You Wearing a Mask in Your Relationship? Great advice, Shel. Number five is so true, isn’t it? Too true! I bet you heard “I didn’t think that was relevant” many a time in your family-law-office years, Jill! Not helpful! Excellent advice, Shel! And you have a rare talent for making legal advice informative as well as entertaining! Clear, concise, helpful advice, Shel. # 4,5, and 7 need to be matted and framed. I had a good friend in college who needed all three of these to get her on track! Yah, sometimes the message gets there a little too late to help those who need it most. Hopefully your friend has been able to help others avoid her own mistakes! Shel, so true!!! Absolutely right on!! I am tempted to print this and put it in the waiting room! Truly great advice! Thanks, Lindsey! I’m tempted myself to attach it to my “welcome” materials – it could alleviate client’s concerns up front and (hopefully!) reduce the “ick” factor on materials received! Very helpful information here. Thanks for sharing your expertise. Where was this when I was going through divorce? Ha ha. Actually, things turned out well because both of us were kind and there wasn’t much dispute. But from what I’ve seen, our situation was rare. Sounds like you were one of the fortunate who knew to allow kindness and common sense to lead through a difficult situation – I hope you’re able to share your wisdom with others struggling through divorce, Rica. Thanks for stopping by! More people need to know these things, Shel. Great advice. Thanks, Peggy – divorce is a difficult enough road to travel without trying to navigate it with a disconnect from your own attorney!Hope you’re enjoying your summer! I think it’s great that you mentioned that lawyers often interrupt in order to save the customer money. They are billed by the hour, so every minute counts. My friend is going through a divorce and his lawyer is very to the point, which he likes, because it saves him money in the long run.